Possible record low number of tornadoes in Oklahoma | Watts Up With That? 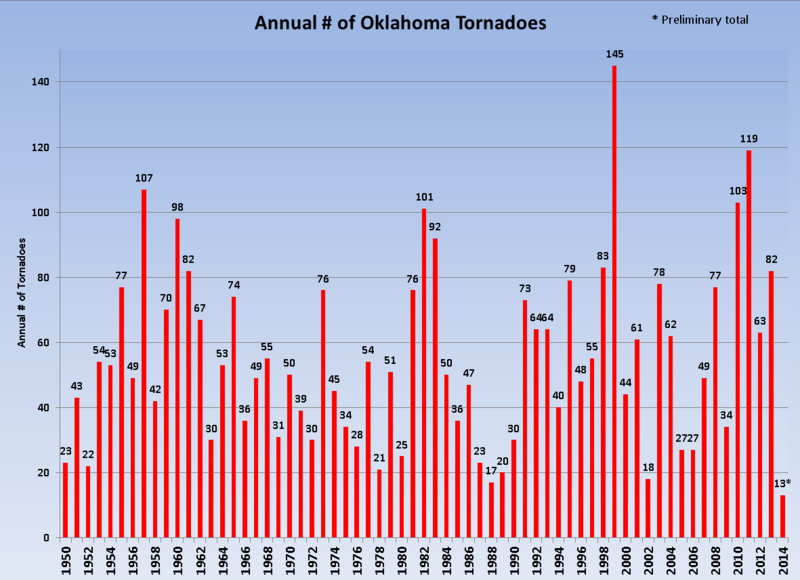 Will Oklahoma set a tornado record this year?? 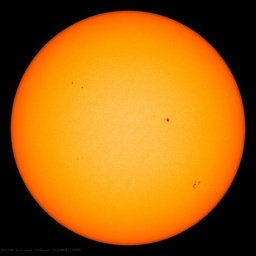 albeit preliminary, is good through September. any of those tornadoes were serious, at least no injuries or deaths were reported, but that is all dependent on where they strike and the strength. the record lowest number of tornadoes at 17. September 30, 2014 in tornadoes. Inconvenient truth. MSM can stay asleep. Nothing to see here. No alarms. No catastrophes. Most importantly, … No ratings upticks in disasters that didn’t happen. BTW: the 2014 Atlantic Hurricane season… another snoozer too. oh oh Look over there….shiny object … Ebola, HongKong…. … snore…. Wake up! News just in today. And the over/under on how long it will be before this case is tied to ‘Global Warming’ will be? Ebola is believed to be transmitted by animals (monkeys seem to be a prime suspect). Evidently if we were in an Ice Age there would be less monkeys, this in turn would reduce the transmission risk. This is similar to the floods in England. If Scotland were covered by a giant glacier then England wouldn´t see so much rain. If you let me run my imagination I can blame just about everything on global warming. Maybe diagnosed in the US, but not contracted here. Now if someone had not been traveling overseas and contracted it here, that would be an issue. And even more of an issue if they aren’t a family member or friend of someone who had just come back from overseas travel. Ebola is believed to be transmitted by animals (monkeys seem to be a prime suspect). Actually Fernando, it seems the most recent outbreak may be bat related, not monkey. The Atlantic hurricane season has a chance to be the second lowest two year total ACE. For 2013-2014 with 80% of the season behind us we are at ACE = 67. The lowest is 82-83 with ACE =45. 3rd – 5th are basically tied at ACE = 70 for year pairs: 93-94, 86-87, and 72-73. 6th is ACE = 86 for years 77-78. Of course we still have 20% of the ACE season to go, and I am sure I jinxed it. I should have mentioned that was using Weatherbell data since 1950. The lowest 3 year total ACE =116 for years 1982-1984. So there is a chance to set that record next year. I wonder how accurate and complete was the 82 -83 Atlantic storm data used to calculate ACE. The 2013 – 2014 calculation certainly included every event with wind speed estimated as high as possible. You must be talking about a subset of the Atlantic hurricane seasons (since 1950?). Try 1913-14 for the record at ACE = 39 (13 = 36 > 4 CAT 1’s and 2 TS’s, 14 = 3 > only one TS in the entire season). Sorry – too much brevity. In 1913 and 1914 the total Accumulated Cyclone Energy was 39. This was comprised of an ACE of 36 in 1913 from 4 CAT1 hurricanes and 2 Tropical Storms and an ACE of 3 in 1914 from a single Tropical Storm. There were no other storms in 1914, although there was one Tropical Depression. Sadly, our children and grand-children may never see a tornado…. Thanks, John from Tassie. Made me laugh first thing in the A.M. Nice way to start the day. If there was ever a good reason for including a “thumbs up” counter Anthony – there is it. That’s all tornadoes, F0 and up? I suspect that the tornadoes are hiding in the deep ocean, right next to all that heat, and, when they come out, they will be very angry tornadoes indeed. Very angry and they will whirl about furiously spewing fish.. and squids. maybe too deep for sharks but not sperm whales. SpermNadoes, when they “rise”, will spew lots of …damage upon us. Yippeeee! Climate change done good!!!! This is to be expected. I established increasing tornado frequency using modern robust and verifiable methods copied from the Penn State Earth System Science Center. Unfortunately for this scientific effort, Missouri has been experiencing very cold weather, and the ENSO is stuck below the level we needed to see the enormous tornado frequencies we predicted. I think we must wait until next year. Hopefully Missouri will experience a monster heat wave and we´ll be proven right. I’m hoping that the entire surface of the earth bursts into flames. That’ll wipe the smug expressions from those deniers. Climate science SNAFU when good news is bad news and bad news is good news. I do not know the actual count, but there is a record being set. The number of MSM stories about tornadoes is at a record low. Lower tornado count reduces habit available to sharks. It’s worse than we thought. It’s severe anthropogenic climate un-tornadoing, and to see why this is awful news, see the next IPCC report, and observe how this is EXACTLY what the computer models said would happen. It’s worse than we thought! Climate change is real people – study it out! As far as I can remember, there was only 1 tornado fatality in the state this year. The unfortunate victim was visiting Quapaw, OK when a concrete wall fell on top of his vehicle and he perished inside. The tornado then went on to strike his own home town of Baxter Springs, KS, nearby across the state line. Quite a bit of damage was done to both of those small towns. Surely the media will cite this as a benefit of increased atmospheric CO2, right? I mean, if it causes the bad stuff, it must cause the good stuff too. In order for the Mainstream Media to pick up an item like this, there needs to be a press released issued from a climate scientist saying that tornadoes are good things which renew the atmosphere and the soil, and that since AGW is causing a reduction in tornados, then it is worse than we thought. You jinxed it. There is a tornado warning in Nowata and Washington counties in northern Oklahoma. May be false alarms. No no no. You’re all wrong. There are fewer tornadoes in Oklahoma because of the injection wells and earthquakes. There was a quake-nado not many years ago and it scared them away. Easy to move things with nothing in them.